Alpha footage of Banished, a city builder from one-man developer Shining Rock Software , walked right by me as it went to YouTube a couple days ago. What was I looking at while it passed behind my back? Something that isn't Banished? That was dumb. Not that I haven't enjoyed it when it works, but after playing way too much SimCity , I really need to look at something different. 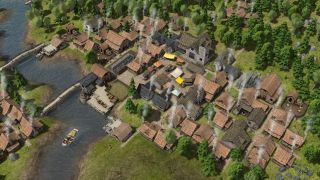 Right now, I want to look at Banished, and then kiss it right in its small-scale, super-detailed city management face. "Surviving the winters will be among your greatest challenges. Your tailors can make clothing, your people can build houses and burn firewood. But necessities have a price—Cutting down forests reduces the deer population you can hunt. Although your foresters can plant new trees, the cures for many diseases can only be found in forests that have existed for decades. Farming for many seasons in one place will ruin the soil. Taking fish and game faster than they reproduce will lead to extinction, and your starvation. Wandering nomads can join your town to grow the population quickly, but allowing them in increases the chance of illnesses from far off lands!" The townspeople will live, work, have kids, and die (sorry, it's tough to make real life sound appealing when pared down), and our job will be to collect resources, manage our population, design a town, and keep everyone healthy and fed. Sadly, the alpha isn't available for us to play just yet, but the developer plans for "some sort of demo build or beta program" before release later this year. There are also no current plans for a Greenlight or Kickstarter campaign, though Shining Rock hasn't ruled out either, writing "I wanted the game to be fairly polished before showing it off to a large group of people, and I wanted something concrete to show before asking for any sort of crowd-sourcing. I've been thinking about these things and how/when/if they'll be done. I'll certainly post news should they happen." The official site has more.